Investigations with reaction calorimeters, such as the OptiMax HFCal Heat Flow Calorimeter and the RC1mx Reaction Calorimeter, provide detailed information needed for thorough scale-up and process safety studies. The RC1 is the gold standard in reaction calorimeters. Assessing safety is a task inherently present early in development. The challenges to developing a safe process can already be observed and addressed during chemical development. Simple tools, such as an EasyMax Chemical Synthesis Reactor or EasyMax HFCal Heat Flow Calorimeter, provide information to allow identification and minimization of the risk of non-scaleable conditions early in development. Screening at small scale increases productivity in development, can be executed with low quantities of precious raw materials, reduces the amount of waste significantly, and provides information critical to taking go-no-go decisions. What is the Value of Reaction Calorimetry? Incidents can be avoided by determining the relevant data at laboratory scale. Laboratory work is performed under process-like conditions using reaction calorimeters, so that the results can be directly applied to larger-scale operations. Reaction calorimetry provides a high level of process understanding, so that the necessary procedures can be performed routinely, robustly and to the required standard of quality. Chemical and pharmaceutical industries often use complex chemical processes in which large amounts of energy can be released. Knowing and understanding the potential risks is critical, and a prerequisite for safe manufacturing of chemical and pharmaceutical products. This includes the understanding of the thermodynamics of the desired reaction, as well as that of a possible undesired reaction. Using the RC1mx Reaction Calorimeter provides reliable data to calculate the relevant safety parameters of the main reaction with the highest degree of confidence. 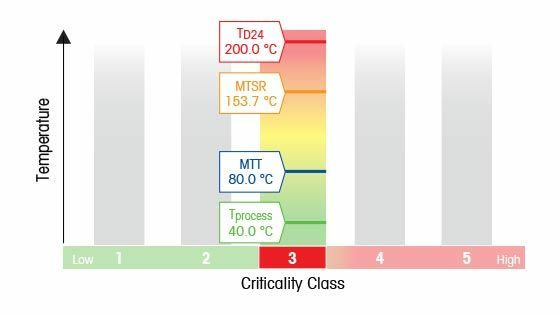 iC Safety turns experimental data into safety information, combines it with data from the undesired reaction and presents the thermal risk (e.g. thermal accumulation, ΔTadiabatic, MTSR etc) in a concise and easy-to-understand format (e.g. table, runaway and criticality graph). EasyMax HFCal and OptiMax HFCal (Heat Flow Calorimeters) combine the benefits of a synthesis workstation and a reaction calorimeter. As small scale reaction calorimeters, they are designed for process safety screening and provide reaction information early in the development process. Heat flow calorimetry data can be used to characterize, optimize and understand process parameters in a controlled, accurate and reproducible environment. The RC1 Reaction Calorimeter is the industry “Gold Standard” for measuring heat profiles, chemical conversion and heat transfer under process-like conditions. The RC1mx Reaction Calorimeter provides a modern solution with a high-performance thermostat as the centerpiece. The RC1mx allows chemical and safety engineers to optimize processes under safe conditions, while determining all critical process parameters and reducing the risk of failure on a large scale. When developing manufacturing processes, information about the process, and the toxicity and stability of raw materials, intermediates and final products, is important. Scientists use this data to establish the ideal reaction procedure and to gain an in-depth understanding of the process itself. The Guide to Process Safety discusses the key challenges to consider when designing a safe process. Bringing new chemical or pharmaceutical entities to market successfully asks for innovative ideas, creative researchers and modern synthesis tools that support an effective development workflow. Experiments are to be carried out at small scale due to lack of material while the data obtained need to be precise. It is imperative that data applied to statistical approaches, e.g. Design-of-Experiments, but also experiments based on traditional procedures, be trustworthy, allowing the identification of scalability and potential safety issues at an early stage in development. This enables increased productivity in chemical development and also ensures that a process can be carried out safely and economically at large scale. Reaction calorimetry measures the heat released from a chemical reaction or physical process under process-like conditions and provides the fundamentals of the thermochemistry and kinetics of a reaction. Calorimetric information is crucial when determining how chemical reactions can be transferred safely from lab to plant. Along with the chemical development workflow, reaction calorimetry provides the information needed for each of the individual steps and is subsequently converted into information to evaluate the risk, scalability and criticality of a process. Reaction calorimetry helps to identify issues related to heat and mass transfer or mixing, and allows the determination of the correct temperature, stirring or dosing profile online. Reaction calorimetry also uncovers unexpected behavior and makes other scalability issues visible and quantifiable. What is Important to Obtain Good Calorimetric Data? Fast responding thermostate with precise temperature control ensures the reaction proceeds along the desired pathway. Large cooling capacity with rapid heat removal copes with fast and violent reactions and large amounts of heat. Sensitive temperature measuring system ensures precise temperature control and accurate calculation of all heat information. 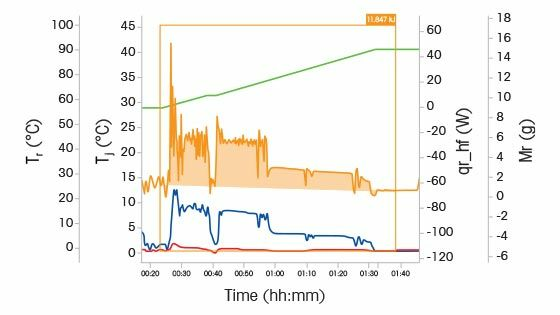 Calculation algorithms take into account not just the measured data, but also physical factors such as heat capacity, heat accumulation, and heat of dosing. Integrated knowledge management and reporting are important to track all experimental information. Getting the most out of an experiment requires consideration of all possible heat flow terms. What is the Heat Flow Principle and How Does it Work? Applicable to all METTLER TOLEDO reaction calorimetry workstations, the heat flow principal is the most simple and robust method to determine the heat released by a chemical or physeical process. It is applicable under most conditions, is highly sensitive and offers excellent repeatability. The heat flow principle is based on the driving force (temperature difference between reaction mass and jacket temperature) which is converted into heat flow by means of the calibration factor. The calibration factor is determined by means of an electrical heater than emits a small amount of energy into the reaction mass. The determination of heat flow is based on the temperature difference across the wall of the reactors and depends on the thermal conductivity and thickness of the reactor wall, the thermal resistance of the reaction mass film, the thermal resistance of the oil film. In a non-isothermal operation, some of the energy is stored in the reactor wall. As a result, the appreciable heat capacity of the reactor wall must be taken into account. A mathematical model is used to calculate the temperature distribution in the reactor wall and gives an (imaginary) jacket temperature. What is the Importance of Accurate Specific Heat Data? When a system heats up/cools down, energy is absorbed/released by the system, If energy is stored or accumulated, the temperature increases and descreses if it is released again. Note that it is not only chemicals that are heated up/cooled down. The total amount of accumulated heat depends on the amount of material, difference in temperature, and specific heat capacity of the material. The consequence is that the heat capacity of the material, the inserts, and the reactor wall need to also be taken into account.